We haven't been writing much about individual games this year. Last night's spectacular one-inning blow-up is going to be an exception. The convenience-store (7-11) outcome was driven by the two-pitcher, 9-run, no-out beginning to the 8th inning that followed a brilliant start by Austin Pruitt in his new role as a starting pitcher (perfect through 4 innings). Pruitt was followed by two clean innings by Neal Wagner, and one by Danny Farquar in his first appearance back with the Bulls. Meanwhile the Bulls had put up 4 runs and were cruising toward yet another shutout and win over the Charlotte Knights. But then in the 8th Danny Farqhuar hit a batter with his first pitch and gave up a single. He left the game with runners on 1st and 2nd with no outs. Diego Castillo came in and, without a single out being recorded, let 8 runs score. His relief, Andrew Kittridge, let one more in. How bad was it? 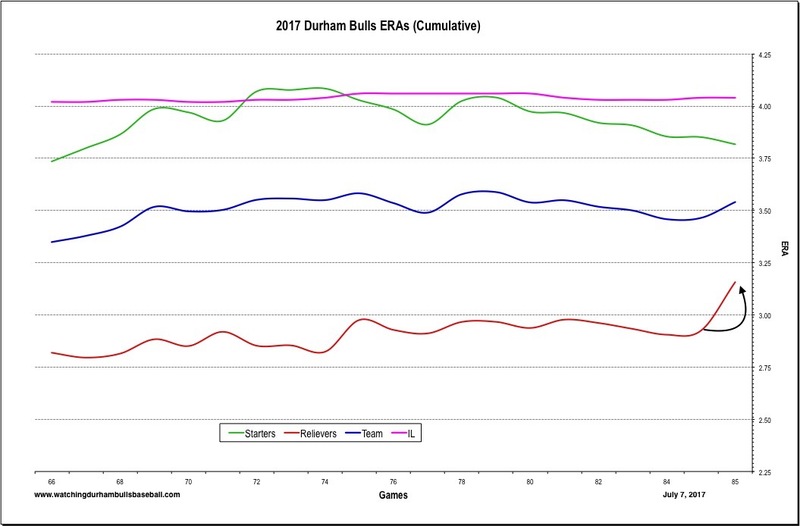 Well, it was bad enough to move the ERA for all the relievers on the Bulls team from 2.93 to 3.16 — in one game! This is on a season where the relievers have pitched 325 innings so far. To say nothing of Diego Castillo's ERA, which went from 2.12 to 5.29. Of course, that came from allowing 6 runs without recording an out (plus two inherited from Farquhar). 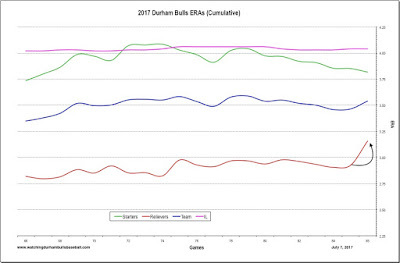 Farquhar, by the way, begins his season with the Bulls with an ERA of 18.00. On the other hand, about the only good thing last night was the performance of the relief crew, which included the same guys (Farquhar and Castillo) who blew up in the 8th in this game. You're still right, however, this year is so much better than the last two. Mostly having fun at the park (and watching on TV) this year.